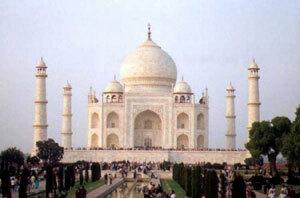 After Bharatpur the intention was to visit the Taj Mahal. The drive to Agra added a few more species including an Egyptian Vulture sitting in a field, my first Large-billed Crow of this trip, a hovering Black-shouldered Kite and, a bit of a highlight, four male and one female Indian Peafowl in a tree. Common birds seen during the drive were Great, Intermediate and Little Egrets, Little Bee-eater, Black Kite, Common Myna, Cattle Egret and Red-wattled Lapwing. I didn't expect to get much at the Taj but it wasn't too bad. Contrary to oft seen photographs the place was packed with visitors, despite it being early evening, and armed security guards checked bags and people at the entrance. I did get another Egyptian Vulture here, hundreds of Rose-ringed Parakeets, Cattle Egrets, Spotted Dove and a Greater Spotted Eagle, plus hundreds of House Swifts were seen flying over the entrance way. A scan of the river Yumuna added a lone River Lapwing, and three Black Kites flew in to roost as we left. I returned to Agra in December 2002, this time arriving around midday. The Taj Mahal itself looked completely different from my last visit, glowing white in the noonday sun. Despite the heat there were a few good birds around. 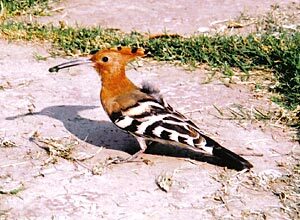 The trees held Large Grey Babbler and Rufous Treepie, Egyptian Vultures circled the minarets and a Hoopoe gave very close views feeding on a caterpillar found on one of the lawns. On one of the buildings by the entrance I was very pleased to find a Brown Rock Chat. The Yumuna River held Indian Cormorants and Ruddy Shelduck.